One way to receive Medicare benefits is to enroll in Original Medicare, or Parts A and B. Original Medicare is managed by the federal government, and provides hospital and medical insurance. However, because there is limited coverage, no out-of-pocket maximum, and no Prescription drug plan included, there are other alternatives in order to receive coverage. One of these alternatives is enrolling in a Medicare Advantage Plan. If you decide to stay with Original Medicare, you can enroll in a Medicare Supplement plan in order to cover the costs that Original Medicare does not. For prescription needs, you can also enroll in a Part D plan to cover drug costs. Medicare Advantage Plans, or part C of Medicare, include all benefits and services covered under Part A and Part B. It is ran by Medicare-approved private insurance companies, and is an alternative to original Medicare. To receive Part C benefits, you must be enrolled in Part A and B. Medicare advantage plans usually include Medicare prescription drug coverage (Part D) as part of the plan. If you have a Medicare Advantage Plan, you cannot enroll in a Medicare Supplement Plan. 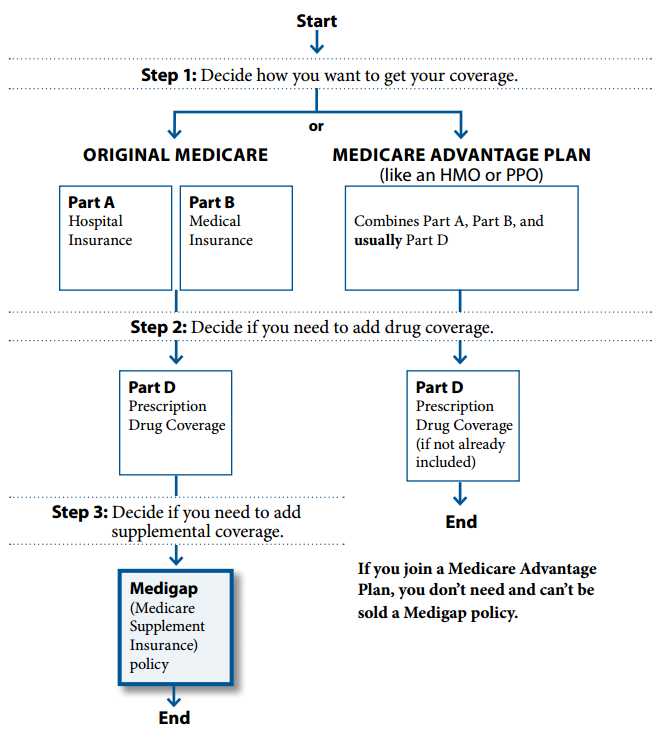 However, if your Medicare Advantage Plan does not include drug coverage, you can enroll in a separate Part D plan.